Mary Harriman, the founder of The Junior League, was a woman ahead of her time, a New York debutante who at the young age of 19 had more than social teas and dances on her mind. The daughter of Union Pacific Railroad titan and financier E. H. Harriman, she used her life of privilege as a platform for social reform. Read More: Who was Mary Harriman? Mary was born on November 17, 1881 and came of age at a time of great change in New York. Thousands of immigrants were arriving every day at Ellis Island, coming to America to find work in the often unsafe and spirit-crushing conditions of Industrial Revolution factories and sweatshops. These new Americans were arriving so quickly and in numbers so great that tenement housing in immigrant neighborhoods was crowded far beyond capacity. As her friend and classmate Nathalie Henderson recalled in 1950, Mary believed that the 85 young women making their debut that year "had the opportunity and the responsibility of making an important contribution to the New York City community . . . [to] do what we could do to improve conditions, and that we should head the way." Mary’s ideas about bettering society began to take shape as a concrete plan while she was studying with Nathalie for her Barnard College entrance examinations. She attended a lecture given by Louise Lockwood about the growing Settlement Movement and the work of Jane Addams at Hull House in Chicago. Mary was impressed with the College Settlement in New York City, where college graduates and students lived among the immigrant population to learn about their problems and needs, and she determined that the debutantes of her year would produce an "entertainment" to raise funds to benefit the settlement house. In her friends Mary saw an untapped resource, and she seized the opportunity to revolutionize the experience of young women being introduced to society. With the debutante system already in place, Mary recognized a self-perpetuating supply of volunteers who "with organized and combined effort" could "put to good use the opportunities afforded them by the advantages of time and means." Mary and Nathalie brought together eight additional young women, and that group of 10 composed a Statement of Purpose: that each year's group of young women would be organized to contribute to the community. Eighty young women joined the first year, eager to enrich their own lives by becoming involved in improving social conditions in their city. The young League’s charter was to enrich its members’ lives by improving the living conditions of its city’s poorest neighborhoods. The Statement of Purpose noted that "the settlement movement is one of the broadest and most efficient of the times, to aid in the solution of a great city," and they named their group The Junior League for the Promotion of Settlement Movements. The New York College Settlement on Rivington Street on New York's Lower East Side was designated as the beneficiary for the first year, chosen because it served "irrespective of church or creed" and was "one of the most deserving efforts in the city to further the growth of the Settlement movement." After the first year's benefit for the College Settlement, League members wanted to become directly involved in the movement. 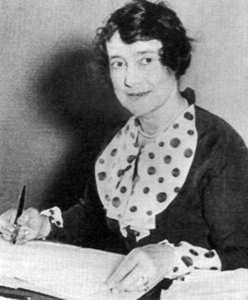 Mary Harriman called upon Mary Kingsbury Simkhovitch, a young woman who, as a student at Boston College and Radcliffe, had become a protégée of Father C. N. Field, the English clergyman of the Tractarian Movement. Father Field had brought to Boston the Tractarians' philosophy of working in the neighborhoods of the poor to improve living conditions and to promote social and spiritual welfare. Mrs. Simkhovitch continued this work in New York City, founding Greenwich House in 1902, and serving as its director until 1948. 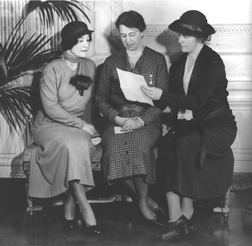 In 1903, Eleanor Roosevelt, a shy young friend of Mary Harriman's, joined the New York Junior League. Her involvement in settlement work was her first introduction to public life in New York City. In her 1947 autobiography, This Is My Story, Eleanor wrote, "I had grown up considerably during the past year and had come to the conclusion that I would not spend another year just doing the social rounds . . . I began to work in the Junior League. "It was in its early stages. Mary Harriman, afterwards Mrs. Charles Cary Rumsey, was the moving spirit. There was no clubhouse; we were just a group of girls anxious to do something helpful in the city in which we lived." Franklin Delano Roosevelt credited Eleanor and her work with The Junior League with showing him a side of society he had never seen before. Franklin Delano Roosevelt would later reminisce that when he first began to court Eleanor, she surprised him with an invitation to visit the settlement house where she worked as a Junior League volunteer. He recalled that she showed him a side of New York he had never seen before, and he credited Eleanor's activism as the inspiration that awakened his social consciousness and led to their lifelong partnership and commitment to social change. Eleanor and her friend Jean Reid worked with youngsters at the Rivington Street Settlement House on New York's Lower East Side. Jean played the piano, and Eleanor kept the children entertained by teaching calisthenics and dancing. By this time, 22 Junior League volunteers were teaching art, calisthenics, dancing, and singing to children in the settlements, and working to improve the literacy, nutrition, and health of their young beneficiaries. Within a few years their efforts expanded to other settlement houses including Greenwich House and Hartley House. Mary Harriman took on a great deal of responsibility in her life beyond the League as well. At 27, after the death of her father, she took over management of her family’s estate, now a National Historic Landmark, becoming in the process an accomplished farmer and a life-long advocate of farming cooperatives. At 29, she married the athlete and sculptor Charles Cary Rumsey with whom she had three children before becoming a widow, at the age of 41, when Charles was killed in a car accident. At 47, defying her family’s political tradition, she joined the Democratic Party, a move significant enough that The New York Times documented it as an important political news story of the day. Her entry into political life ultimately led to an appointment by President Roosevelt, at the age of 53, as the Chair of the first government consumer rights group, the Consumer Advisory Board (CAB) of the National Recovery Administration (NRA). The position made her one of the highest-ranking women in the administration and from there she went on to promote the formation of consumer groups across the country. Mary Harriman’s ground-breaking work for FDR’s National Recovery Administration made her one of the highest-ranking women in the administration. Less than a year later, Mary Harriman, spirited pioneer of compassionate voluntarism, died in a horseback-riding accident, having suffered injuries that today would not have proven fatal for the life-long equestrian. 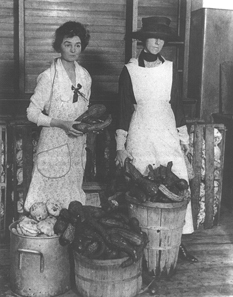 The simple yet brilliant proposal made by Mary and her peers that they would be "aided by as many" volunteers "as may be sufficiently interested" has led to the exponential growth of the League from 10 young society women in 1901 to hundreds of thousands of women who today serve their communities for as much as 20 years or more. The Junior League of the City of New York is today comprised of approximately 3,000 trained volunteers, more than three-quarters of whom are employed and who donate more than 250,000 hours of service to the community each year.